Using the bio-modem from Spider-Man Team-Up #7 (I told you we’d see it again), Zemo is utilizing an old AIM satellite to slowly take control of the world, with a cloaking device so the heroes can’t track them. However, Jolt sees that while Techno (the Fixer prefers his Thunderbolt name to go along with his new beloved robotic body) is on the same page as Zemo the others aren’t. MACH-1 and Songbird seem to like being heroes, while Moonstone has her own agenda and Jolt’s not ready to trust her again. She is however ready to trust Atlas, which proves to be a mistake when he sides with Zemo and Techno, the trio easily defeating the quartet. On the plus side, Jolt is able to destroy the cloaking device and the heroes come running. On the negative side Zemo set up a bio-modem in the shuttle bay and now he controls them as well. What they got right: I was disappointed to see Atlas side with Zemo but not surprised. Goliath is Zemo’s lapdog as we saw in the “Flashback Month” special and the veiled origin story. However, seeing Beetle/MACH-1 and Screaming Mimi/Songbird realize Zemo was using them was nice to see and it’s a darn good cliffhanger. What they got wrong: But we really didn’t get to see them turn into full-on heroes, only opposing Zemo once they realized they were manipulated, not because Jolt convinced them to become heroes. I was hoping for a full-on hero turn. Except from Moonstone because I know better than that and she’s probably just mad that Zemo ruined her chance to complete her sentence and have a clean record. Recommendation: This is still a series to pick up but if you haven’t been following the story this issue won’t mean much to you. 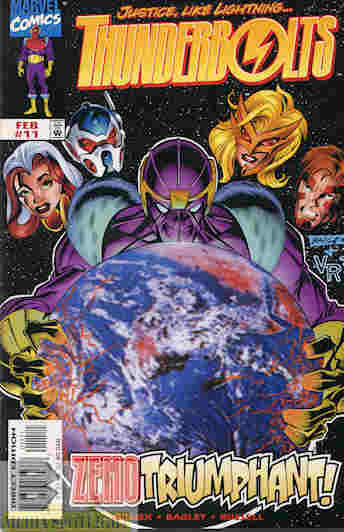 Posted by ShadowWing Tronix on December 12, 2017 in Marvel Spotlight, Yesterday's Comics and tagged Atlas, Baron Zemo, Goliath, Hallie Takahama, Jolt, Mach-1, Moonstone, Songbird, Techno, Thunderbolts.